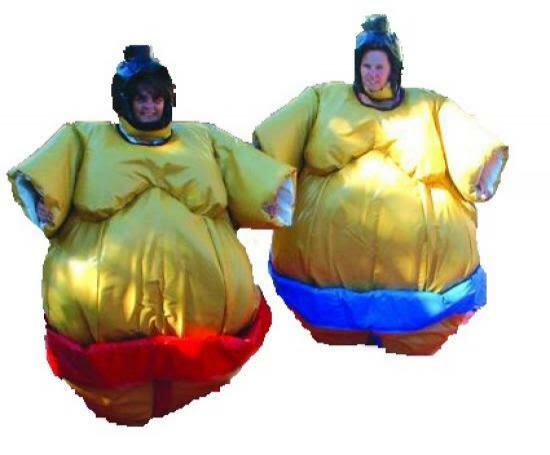 kids and adult sumo suits hire liverpool. Adult 8ftx8ft mat & Sumo Wrestling suit - A great new game for the more physical client!.Sumo Wresting suits are hilarious game for everyone taking part or watching! ages 14/ to adult, our sumo suits packages include two padded sumo suits,two adjustable head guards,two neck pads and a wresting pad.We deliver our themed bouncy castles, inflatable slides,rodeo bull hire,plus are assault courses and adult bouncy castles and domes,to Merseyside & Liverpool, Widnes, Runcorn, Wirral,Warrington, and St Helens, and some of these areas and further areas will be a additional fuel charge or toll/tunnel charge.Check our delivery checker on our home page,it will tell you if there is a charge for your area.